LA/C Orchard made his first recorded flight in an aircraft on 5th July 1939, when the Pilot's Flying Log Book in which he was to record all his flying for the next 20 months shows its first entry, a flight lasting 45 minutes in Tiger Moth G-AECH, piloted by the instructor, Mr.Mathias. Harold had been posted to No.7 Elementary & Reserve Flying Training School at the civilian Flying School at Desford, a few miles west of Leicester, where he was part of No.21 Ab Initio Training Course. Desford was one of thirteen such schools which had been co-opted by the RAF for initial flying training as part of the pre-war expansion scheme. Instruction was given largely by civilian instructors, although RAF personnel often tested the pupils. As they were serving on a civil airfield, the trainee pilots were attached on paper to Headquarters Reserve Command for purposes of pay and administration. 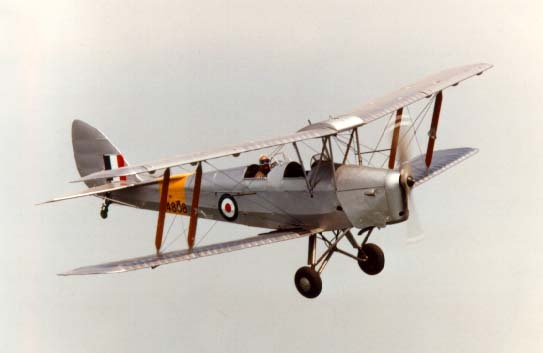 As with many training schools, Desford was equipped with the de Haviland 82A, known to the RAF as the Tiger Moth MkII. This was a development from a long line of Gypsy Moths, first produced as the DH60 in 1925. The DH82 was produced from 1934 until 1945, and was the standard ab initio trainer at the time. The biplane was fairly small, with a wing-span of 29ft 4ins and a length of 23ft 11ins, and quite slow, having a maximum speed of 104mph at sea level. It could operate at 13,600ft, although it took over 21 minutes to climb to that height. The crew of two, normally a pupil and an instructor, sat in two cockpits, one behind the other. The rear cockpit on training aircraft was fitted with a special hood so that instrument - 'blind' - flying could be practised during the day. In total Harold was to log 52 hours in the type, the majority of flights being in G-ADXU (31 flights totalling nearly 21 hours). He also spent nearly 7 hours in N6480 (11 flights), and also flew at least once in eleven other Tiger Moths. Throughout his course at Desford his instructor was invariably Mr.A.Mathias. The first 9 hours 45 minutes were spent learning various basic skills on the aircraft, such as taxying, flying straight and level, turning, climbing, gliding, taking off and landing, and action in emergencies such as engine stalling or a fire. At the end of this time another instructor, Mr Johnson, tested Harold for his first Solo Flight, which he made after 10 hours and 10 minutes, the flight itself lasting just 5 minutes (in G-ADXU) on 2nd August 1939. The next day Harold made a further two, much longer, solo flights, these being of 40 and 20 minutes duration. A further series of practices in basic flying skills continued for some two and a half hours, and then on 11th August S/Ldr Lee administered a test for suitability as an RAF pilot. Having succesfully passed, instruction moved from the basics to more advanced skills such as aerobatics, forced landings, air navigation and instrument flying. These were practised both with the instructor and as a solo pilot. The routine continued until 6th September, when Harold had logged 41 hours and 45 minutes flying, 20 hours 30 minutes of these being solo. F/Lt Hopcroft then administered the RAF 45 hour test. Three days previously Harold had noted in his Log Book 'September 3rd 1939 - War declared with Germany'. Although not an officially required entry, it was no doubt acceptable. During the following week, flying skills were continually practised, until on 14th September Harold piloted N6948 on two solo Cross Country tests, both lasting 55 minutes. In an entry dated 16th September 1939, the Desford Chief Flying Instructor, F/O A.G.Bullmore, noted that Harold had flown a total of 25 hours 10 minutes dual, and 26 hours 50 minutes as a solo pilot. Included in this was 5 hours 30 minutes instrument flying. He graded Harold as an 'Above Average' pilot, with no special faults. Harold was well on his way to becoming a fully qualified RAF pilot.